In the year I spent pinning images for inspiration while we tried, and failed, and tried again to buy a house for our growing family, one thing that kept popping up in homes I admired was chalkboard walls. 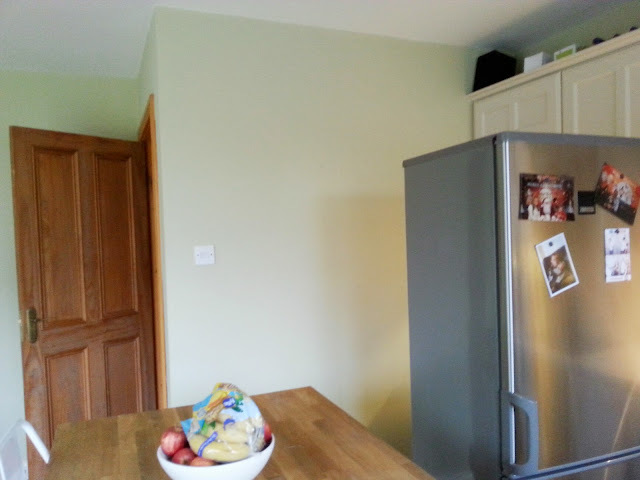 So, when we finally moved into our new house and started to look around and see what we could do to make it our own on our little budget, it didn't take long for me to look at this wall beside the fridge and decide that black was definitely the colour for here! 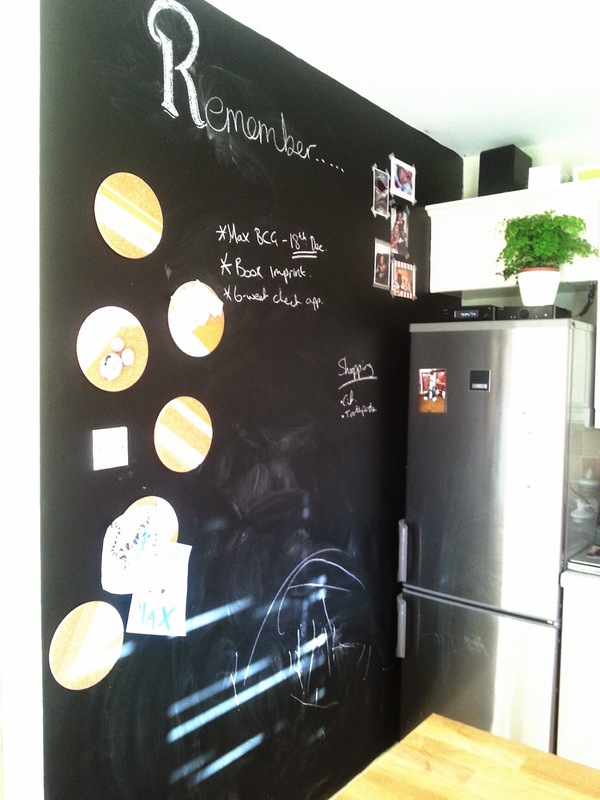 I wanted our chalkboard wall to be functional as well as decorative so this really was the perfect place for it. I am a maker of lists, however, if they're not right in front of me I totally forget to check them. 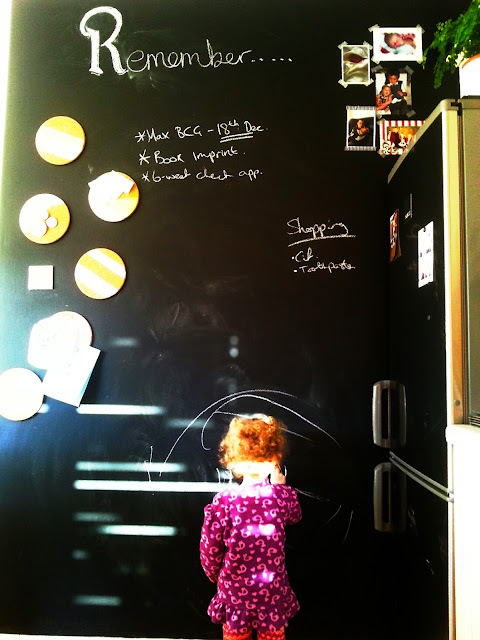 Also I have an artistic two year old who thinks walls are the ultimate canvas so this wall was going to be a place I could solve both problems, and having it right beside the fridge meant I couldn't miss it and I could keep an eye on Em as she drew while I was cooking, perfect! I used less than 1 ltr of paint that I picked up in Aldi for €5.99 (I actually bought two but I didn't need the second tin), but they sell it in all the big hardware shops, and you can even get it in different colours or with metal added to it to make it magnetic, adding another dimension to your wall :) I did two quick coats, and that was plenty. 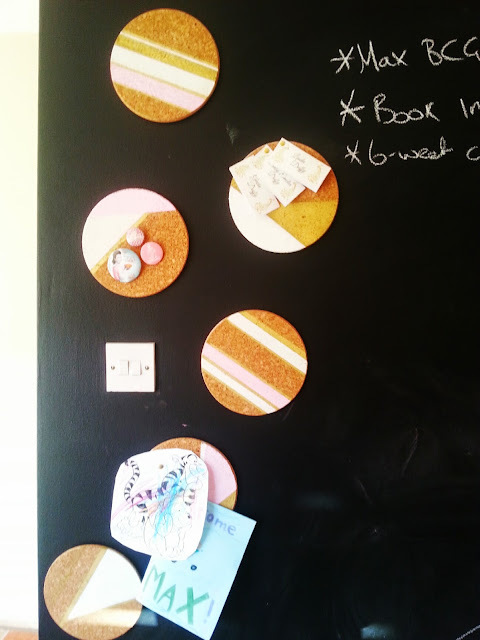 I also made these little cork boards so that I can pin things I want to keep, or need to make sure I don't lose! I bought two packs of three cork pot stands from Ikea (I think they were a couple of euro a pack), I taped them off and painted them with geometric shapes that compliment the colours in my kitchen, dining and living room (which are connected) and then I stuck them on the wall with command strip velcro strips. And there you have it! We really love it, and honestly it's been the most useful thing we've put into this house so far, it gets used every day. It's holding up really well, even though I often use a wet cloth to clean it down properly. This looks really good, if I had a wall I would totally do this. 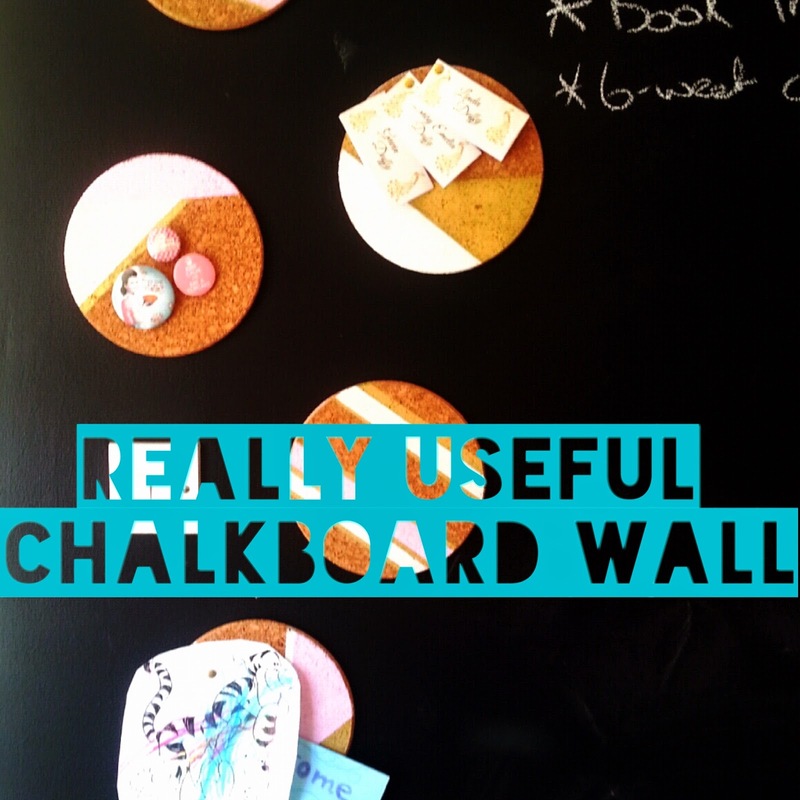 You scored with the chalk paint in Aldi, I find it's quite expensive in B&Q, etc. It looks great painted on glass jars in a sort of 'label' shape so you write the contents on.